On 11 October 1965, the New York Times published a story that challenged much of what we had always known about European settlement in America. Yale University had just published The Vinland Map and the Tartar Relation. This introduced a fifteenth-century manuscript and map that supposedly proved Norsemen had colonies in the New World long before Christopher Columbus arrived, and that Europeans knew about it. The key document was the Vinland Map, penned by an unknown scribe and bound with a manuscript that described a church mission to Mongolia. The map, dated to about 1440 (eleven years before Columbus was born), showed areas of exploration all over Europe, North Africa, and Asia. It also showed a place called Vinland, an island west of Greenland. This was an incredibly inflammatory thing to do, especially just one day before Columbus Day. Yale was immediately bombarded with protests and letters about how they were charlatans bent on perverting American history, defaming Italians, … you name it. On the Yale campus, a group of law students made an effigy map and burned it. The student behind the flames is Joe Lieberman, who later served four terms in the U.S. Senate and almost became our Vice President. The president of the Italian Historical Society of America wrote, "Twenty-one million Americans will resent this great insult to Columbus. Especially on a day that we're honoring him." Yale stood by their analysis that the map was genuine, claiming it was even more valuable than their original Gutenberg Bible. When they sent it to the British Museum for further investigation, they insured the map for 25 million dollars and kept it under armed guard around the clock. The measures they took to protect the map in transit might have been lifted straight from a James Bond movie. Eventually, even Yale came around to the idea that the map is a forgery. The parchment really is from the fifteenth century, but the drawing was probably done in the twentieth. Who did it, and why, remain a mystery. Earlier in 2018, a group at Yale's Institute for the Preservation of Cultural Heritage examined the Vinland Map. They repeated some previous tests with more modern equipment, and ran some new tests with new equipment. As before, they will study the chemical composition of the parchment and its ink. They even sent small samples of the parchment from the map and its associated manuscripts to the University of York in England, for DNA analysis. They'd like to know what kind of animals were used to make the parchment, and where they lived. They expect to finish this analysis later in 2018. The results will be published in a book compiled by Raymond Clemens, curator at Yale's Beinecke Rare Book and Manuscript Library. While that's going on, the Vinland Map is on public display at the Mystic Seaport Museum — its first trip away from Yale in over fifty years. The ink on the map is faded. Any attempt to photograph it at the exhibit would only show a monotone blob; so here's a standard image of it, with some color added to make it easier to read. The Vinland Map might be a fake, but the Norse presence in North America was real. 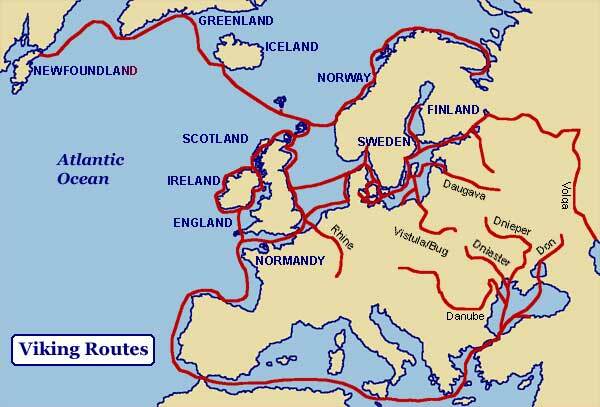 For three centuries, Vikings travelled all over Europe and Asia, mostly by water. Their westward expansion included a temporary settlement in what is now Canada. Although North Americans and Southern Europeans discounted the history, Scandinavians and Icelanders knew about this for a long time because of the oral traditions passed down in the Greenlanders' Saga and Eirik's Saga. While scholars from Yale and the British Museum were examining their 15th-century map half a century ago, Helge and Anne Stine Ingstad were excavating some ruins at the tip of Newfoundland's Great Northern Peninsula. They found artifacts that proved the presence of Vikings at L'Anse aux Meadows, around the turn of the 11th century. They dug patiently for eight summers, mapping a very unusual settlement. Then they replaced all the earth from their excavation, ready for some future invention or technique that might glean more information about the people who lived and worked here. UNESCO designated the place as a World Heritage Site in 1978, the first place in the world to be so listed. We had the good fortune to visit this place in 2003. Unlike other Norse settlements in Iceland and Greenland, L'Anse aux Meadows was apparently never meant to be permanent. It probably wasn't the elusive Vinland, either. There is no sign of agriculture or livestock there — all supplies had to be imported. There are no graves. Seven of the eight buildings found there were dwellings. The eighth, away from the others on the other side of the brook, was a small forge. There was woodworking in some of the buildings, but this was mainly a residential community. The evidence is strong that this was a repair station to support ships that were on their way to somewhere else. That other place hasn't been found yet. We know the Vikings went farther because grapes and butternuts were found here. These didn't grow in northern Newfoundland because the climate was too cool, even during the medieval warm period. Birgitta Linderoth Wallace worked with the Ingstads when they excavated the Norse settlement in the 1960s. Her site plan that we just saw is the basis for the diorama on display at Mystic. There is a more accurate diorama at the L'Anse aux Meadows National Historical Site. Let's take a closer look at Dr. Wallace's site plan, described in detail in her paper about the excavation and the possible location of Vinland. 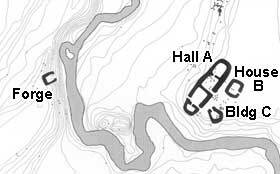 In the "ABC complex" closest to the brook, Building C is a small round hut that was probably used as slave quarters. When Parks Canada built their modern replica of these buildings, they originally put a square hut in this location. It appears that whoever built the Mystic diorama has copied this arrangement. The second special exhibit at Mystic this year is called The Vikings Begin, on loan from Gustavianum, the museum of Uppsala University. This is a priceless collection of artifacts from boat graves of the 6th to 8th centuries. That period immediately precedes the Viking Age. It's called the Vendel Period after the place where its ruins were first discovered by modern archeologists. The pieces we saw are being shown outside of Sweden for the first time ever. Boat graves are probably not what you think they are. We get a lot of bad information from Hollywood, especially from an era where facts took a back seat to grand productions on the big screen. Blockbusters like 1958's The Vikings have left us with a false impression of the term Viking funeral, complete with burning arrows and a longboat pyre that floated away before sinking as the curtain came down. It didn't work like that. A warrior (warriors were both men and women) would probably be given a ship burial, but on land. Often, the ship was a proxy made from rocks, but sometimes it was a simple wood boat like the visitor sees at the entrance to the Gustavianum exhibit. The body (or cremated remains) of the dead warrior was laid on an eiderdown mattress in the boat, along with offerings to be used in the next world. Grave goods included armor and weapons, jewels, household utensils, and sometimes slaves and domestic animals who were sacrificed. Then piles of stone or soil were laid on top, forming a small mound. An especially rich collection of these graves was found at Valsgärde, which is convenient because it's only four miles from Uppsala. This is near the mouth of the Gulf of Bothnia, which separates southern Sweden from Finland. This cemetery was used from the fifth through eleventh centuries. The Gustavianum exhibit has items extracted from several boat graves. All are from the seventh century, except for one piece that is noted here. That is, these items represent the people who developed the Viking culture. Boat burials continued through the Viking period, after which people started using more conventional graves or tombs. Every warrior needs a helmet. They didn't have horns — that was an invention of 19th-century German opera. They did have plenty of protection for the wearer's nose and ears. These were made of metal that was precious at the time, with lavish attention to tooling and detail. There can be no doubt that Valsgärde was a wealthy place. The blade of this sword has been lost; only the hilt remains. The shield is from a nearby, contemporary grave. Even this man's horse was richly appointed. Boat decorations from the same grave as the sword and harness. The glass beads and brooches were from a different grave, probably belonging to a woman. From the same grave as the shield. That warrior would be able to eat and drink in style when he arrived at Valhalla. The collapsible scale, with weights and pouch, is from the Viking period. They were found in a 10th-century boat grave, possibly having been used in trade along the Silk Road. Vikings traded their goods for silver coins, which they valued only by weight. Face value meant nothing to them. Interaction between Vikings and early Moslems — who were beginning to take root about the same time — defies the imagination, just as it's hard to get one's head around the idea of Vikings meeting Beothuks and Mi'kmaq in North America. But it's well documented, at least in the first case. Ahmed ibn Fadlan was a trader from Baghdad who lived among the Rus (Vikings) along the Volga River, keeping a detailed journal. His lurid eyewitness account has been particularly useful to describe the rituals that went with ship burials. 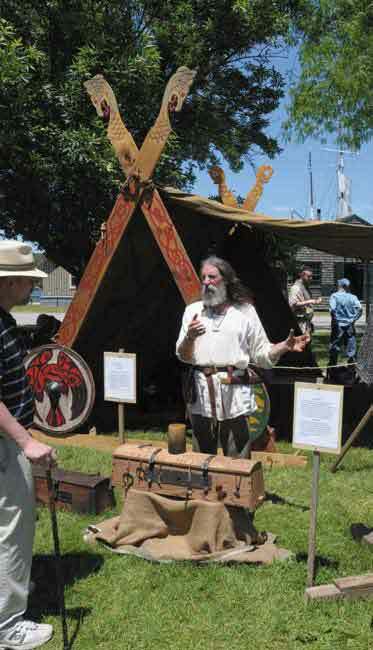 We were in town for Viking Days, a special weekend that featured a lecture series and re-enactors on the museum's Village Green. After explaining how to make helmets and chain mail, this fellow spoke for quite a while about the Mästermyr tool chest in front of him. He's Ivar Husasmidur, who made all three items. For a few silver coins, he'll make some for you. Josh got to try the Viking life, at least long enough for a tourist shot. Note the proper helmet to protect most of his face, but it's iron, not precious bronze. He'll have to work harder to merit a good ship burial. We watched Þórólf ("Thor") and Ælfi mix it up. She trounced him. They both also fight right-handed, but she beats him that way, too. I once had a neighbor named Elfi. I'm glad we got along. We could also learn how to make mead. The glass bottle is modern, but the principle is the same as for the old crock. Viking games near the temporary exhibits. This one is a bit harder than it looks. Throw your wood chip to knock over the ones across the court. On the porch of the building with the Uppsala treasures, there's a boat that's obviously meant to be used by the living. Harald and Gyða were like Romeo and Juliet. Haraldr Hálfdanarson was in love with Gyða Eiriksdóttir, but her father was a rival king who hated him. Harald would not be allowed to marry Gyða unless he were king of all of Norway, which was split between three warring kingdoms at the time. Almost all of the people lived in small towns along the coast, and they fought bitterly every time they met. In 872, Harald put down the armies of the other two kingdoms at the Battle of Hafrsfjord, bringing all of Norway under control of one monarch for the first time. It was a brutal, bloody battle, with the casualties including the man who would have been his father-in-law, Eirik. But he was thereafter known as Harald Hårfagre (Fairhair), the first king of all of Norway. Today, a monument called Sverd i Fjell (Swords in Stone) stands on the site of that battle (near Stavanger) to commemorate the unification of Norway. There are three swords, one for each kingdom, embedded in the rock like Arthur's Excalibur. Each is more than 30 feet tall. Unlike Romeo, Harald had many lovers. He had about twenty sons with five or six women (including Gyða). Their struggles almost broke up the new country when Harald was an old man, but the unification prevailed and he is remembered as King Harald I. In 2010, the wealthy oilman Sigurd Aase commissioned Draken Harald Hårfagre, a 115-foot Viking longboat built in Haugesund where Harald I is buried. She was launched in 2012, and in 2016 began an expedition that ended at Mystic Seaport. This splendid vessel was still there for Viking Days, offering tours for those with patience for long lines. The bow features a dragon worthy of a ship named Draken. The stern is a dragon's tail, but with a modern touch. The ravens are vigilant, lest the helmsman get tired or distracted. Shortly after this special weekend, the two-year layover ended. Draken Harald Hårfagre left Mystic for her 2018 East Coat Tour, which will end in South Carolina later this year. Mystic Seaport's normal activities continue during their special weekends. Every day at 11:15, visitors may climb the rigging and learn how to set a sail on Joseph Conrad, named for the Polish author with the English name. This ship also has Viking roots. She was built in Denmark as a training vessel in 1882. Fifteen minutes later, a lookout high on the main mast of Charles W. Morgan spots a whale. This begins a dialogue with the captain. "How many and how far?" Even if the lookout can't see the whale itself, he can identify it by the shape and orientation of its spout. For example, the right whale has a distinctive double spout. Then things get busy. First, a dory is lowered with two crew aboard. Then the rest of them slide down the lines to take their places. One of the docents pauses in her duties to explain how harpoons work. Then the crew set out to snag their prey, which usually begins a wild run called a Nantucket Sleigh Ride. Edwin Drake found oil in Pennsylvania in 1859. That was the beginning of the end for the whaling industry, because people could now get fuel for their lamps without the need for long, dangerous sea voyages. The stuff also turned out to be useful to run engines, displacing horses on land and sails at sea. But that's another story altogether. Ingstad, Anne Stine, The Discovery of a Norse Settlement in America, Universitetsforlaget, Oslo, 1977. Ingstad, Helge and Anne Stine, The Viking Discovery of America, Checkmark, 2001. Magnus Magnusson and Hermann Pálsson (translators), The Vinland Sagas, Penguin, London, 1965. Munn, W.A. Wineland Voyages: Location of Helluland, Markland, and Vinland, St. John's, Nfld., 1914. Seaver, Kirsten A., Maps, Myths, and Men: The Story of the Vinland Map, Stanford Press, Stanford, Calif., 2004. Skelton, R.A., Marston, Thomas E., and Painter, George D., The Vinland Map and the Tartar Relation, 2d ed., Yale Press, New Haven, 1995. Wallace, Birgitta, Westward Vikings: The Saga of L'Anse aux Meadows, Historic Sites Assoc. of Newfoundland and Labrador, St. John's, 2006.